July Series Registration is OPEN until classes start. We believe that learning to dance should be fun and challenging and address the unique goals of each dancer. So we are doing away with our old “leveled” tracks in favor of classes catering to learning goals. Four months of our Beginners Track will remain for those new to swing or new to a dance role. We have re-organized its content so that each series will cover two different rhythms each month: 8ct/6ct (A), 8ct/Charleston (B), 6ct/8ct (C), 6ct/Charleston (D). 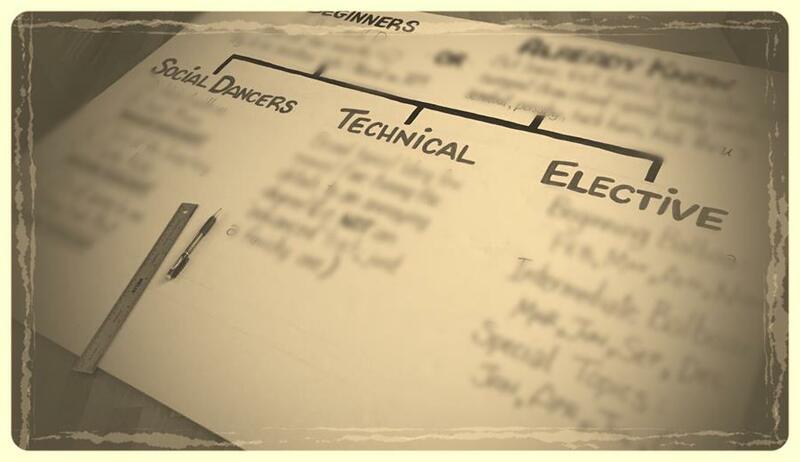 After that, you may choose either our Social Dancers Track focused on building vocabulary, dancing well, and mastering transitions, or our Technical Track where we dive deeply into drilling and mastering simple movements. The Elective Track and Balboa Track will remain for Balboa and other special topics which will have their own pre-requisites. There may be some overlap with material you have learned before, but we hope this new curriculum will broaden your pool of partners and bring a wider perspective to this amazing dance!